AV integrators demand the highest resolution video offering both detail and colour accuracy when creating the most stunning visual displays. From command and control rooms to reception areas, collaboration environments and digital signage applications, the VisionSC-UHD2 ensures the very best quality and ultimate customer satisfaction. Providing two HDMI 2.0 capture channels with HDCP2.2 support at 4K60p with 4:4:4 chroma sampling, the VisionSC-UHD2 complements our hugely successful VisionSC capture card family and offers unparalleled performance in frame grabber technology. 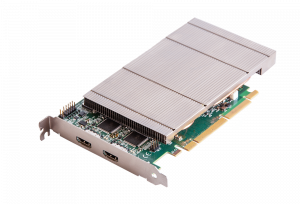 The VisionSC-UHD2 supports all Datapath Vision Performance features. This includes LiveStream for a single line of capture latency, MultiStream for multiple capture instances, hardware timestamping, HDMI signal conditioning to support longer cable runs, automatic fast and reliable mode detection, frame synchronised ganging of inputs (dual 4K into 8K x 2K), flexible onboard Colour Space Converter, plus a whole lot more. An advanced hardware scaling engine employs polyphase multi-tap filtering for superior anti-aliasing when downscaling and accurate pixel replication when upscaling.